Auxilium Solutions drives internal processes by setting a clear, measurable standard of performance. Our intention is to provide the customer with an expectation of service within a known timescale and the ability to monitor when service levels are not being met. A responsible outsourcing company can help take your back-end processes and streamline them to give your business real benefits and improved profitability. We allow you to focus on your core business including growing your customers rather than on high-volume, process-oriented tasks that we can perform equally, if not more efficiently. Helping you be more strategically oriented is what we do. With a unique focus on growth, we sit at the intersection of people and technology to deliver deep expertise in cloud-based digital customer services. First we develop an in depth understanding of your business, culture, work processes and what it is that you want to do. People are our passion and our power. Once we have a clear understanding of your business, we then develop a tailor made solution to meet your business requirements. We recruit the best people and then train, deploy and manage them as well to deliver the ideal back office service to your business. We don’t want to just “support” a client’s business – we want to improve its customer experience, spark innovation and drive revenue through results. We excel at designing and establishing the systems to deliver the service including: IT, people, workflow, reporting, service benchmarks and quality control. Keeping customers happy and making sure they’re heard is a pillar of every strong company. It’s definitely not a one size fits all solution. Do customers need assistance at times when your staff is not available? Do customers require service at a volume your current staff cannot provide? You can get the amount of service that fits your company best at the times you need it. Your customers depend on you to provide them with excellent customer service, and Auxilium Solutions can do that. Our focus is on the interactions that your customers have with your products and we are aiming to fulfill their needs. The Auxilium Solutions Relationship Manager is your concierge to our transparent process and manages your team, assesses infrastructure, maintains communication flow, audits and measures ROI Service Level Agreements , manages boundaries and expectations, customer commitments and clearly defined promises which reduce the chances of disappointing a customer. Your consumers can receive service on their premises, avoid wasting time in long queues and get their inquiries processed faster than ever. Let us show you how good we are at balancing the great things technology can provide us with as well as our sense of what defines quality service. Our impact on your company will be huge, but we don’t just tell you that. We’ll provide Key Performance Indicators that actually measure our success in getting your company to where you need it to be. That way, you’re making key data-driven decisions on all aspects of your company’s future. We’ll set precedents and then show you when we break records. Regulatory compliance describes the goal that organizations aspire to achieve in their efforts to ensure that they are aware of and take steps to comply with relevant laws, policies, and regulations. Auxilium Solutions offers comprehensive design and implementation of compliance management systems, specialized skills training, and evaluations of existing systems and processes. Getting help with compliance can increase efficiency in your business by decreasing the amount of documentation required by regulatory bodies that you or your employees must personally administer and oversee. Having a strong compliance posture builds customer trust and brand loyalty, which means lasting and positive business relationships. In fact, consumers gravitate towards brands that publicize their compliance practices and studies also show that companies able to link business risks with strategic imperatives tend to achieve a better profit margin growth. Let us show you how. We can help reduce infrastructure and logistical costs as well as improve the operational efficiency of merchants and retailing businesses. Our fulfillment services provide receiving, processing and delivery on behalf of your company. We are focused on the customer experience, quality, safety, and productivity. Let us help you take the hassle and stress out of your supply chain. 24/7 USA based call support: Whatever industry you serve there are certain standards that exist in all sectors. It is not just a matter of the language but also terminologies. If you work in a specific sector, your back office partners should be able to understand all the required business terminologies. This helps make sure the back end processes and documentation are carried out without a glitch that may end up costing you. Preventing chargebacks is the key to avoiding issues with your merchant accounts and the best defense is a good offense. It’s ideal to ensure strong communication with your customers. In the event that a chargeback should occur, Auxilium Solutions can help mitigate and avoid chargebacks in the future. The purpose of this service is to help merchants reduce their chargebacks and their chargeback ratio so that they can continue doing business. Our goal is to get you up to par and under the 2% Threshold of chargebacks/returns. The term customer support is adequate for services that provide technical support, whereas the customer service department is focused on providing value for the customer. At Auxilium, we specialize in both. We focus on helping customers to use your products and services correctly, efficiently, and effectively. Our agents maintain a positive attitude and convey the message of your brand in the best possible way. Auxilium Solutions was formulated on a concept: a back office service provider that doesn’t only provide support to the customers, but also contributes towards the strategic goals of the company by providing day-to-day guidance to the customers in order to makes those activities part of the organization’s mission. To personalise our service offerings and deliveries to better increase customer satisfaction and the service experience in an eco-friendly and virtually paperless environment, was the dream. Today, Auxilium Solutions is a boutique size firm on a mission: If you’re selling a commodity, you need to make yourself stand out. In addition to a great product at an affordable price, the consumer requires excellent customer service and nothing less. Auxilium Solutions is dedicated to helping your back office run as smoothly and efficiently as possible. Happy customers are a lot more likely to tell their friends—on average, happy customers tell nine people about their experiences with a company. Our Specialists attract potential customers by answering product and service questions and suggesting information about other products and services. They process orders, prepare correspondences and fulfill customer needs to ensure customer satisfaction. Our skills and experience ensure that your company delivers the highest standards of service to your customers. Together, wee develop an in depth understanding of your business, culture, work processes and what it is that you want to do. We design and establish the systems to deliver the services you need including: IT, people, workflow, reporting, service benchmarks and quality control. We recruit the best people and then train, deploy and manage them as well to deliver the ideal back office service to your business. Our fulfillment services provide receiving, processing and delivery on behalf of your company. Connect with us with the form below. Thank you. 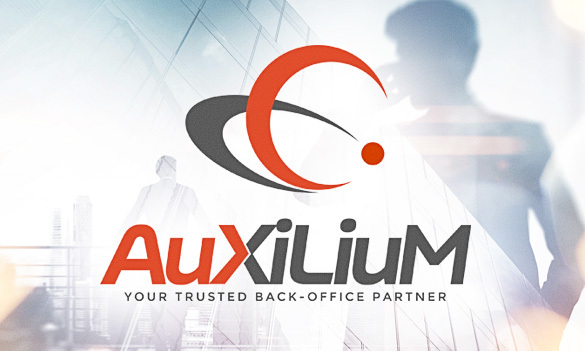 AuXiLiuM - Your Trusted Back-Office Partner.